Noah Smith has a post on the failure of macro theory to predict the crisis. He concedes that DSGE models did very badly on this score, but, he continues, “There are no other models out there that did forecast the crisis” and there is no better alternative. First of all, there is nothing wrong with chartblogging. In fact, Noah Smith is a chartblogger—an excellent one. Having said that, is Godley’s argument just hand-wavey-capitalism-sux-chartblogging or is there something more to it (perhaps even some real modeling)? To begin with, Godley’s argument in the Seven Unsustainable Processes (which is a policy paper) is based on his theoretical work. Godley was one of the major proponents of what is today called Stock-Flow Consistent methodology. Some of his books and his writings (with real models and everything) are here, here, and here. Based on this theoretical work, in the 1990s Godley built a more policy-oriented macroeconomic model at the Levy Economics Institute. The simulations in the Seven Unsustainable Processes were produced with this model (and are thus far from chartblogging). To understand the argument of the Seven Unsustainable Processes we need to keep two things in mind. First of all, the analysis is Keynesian, so it is aggregate demand that drives output, employment, and growth. These Keynesian results do not stem from imposing rigidities on an otherwise supply-side neoclassical model. In other words, the sum of the private sector and government sector deficit is always equal to the current account deficit. Accounting consistency requires that the flows expressed in the three balances accumulate into related stocks. For example, if the private sector is running a deficit, that will (ceteris paribus) tend to decrease its net worth and increase its debt and debt-to-income ratio. The examination of these financial balances in relation to income (or GDP) is important because it gives clues about (i) central structural characteristics of an economy, (ii) which component of demand is driving growth, and finally (iii) what net assets/income ratio for each sector is implied from the current situation. How has the Greek government used international loans? We start by estimating the funds received, using the table on “Financial liabilities broken down by holding sector,” and taking the line “Long-term loans received from abroad.” The largest part of these funds has been used to reduce the existing stock of debt held abroad: line 2 in Table 1 is obtained by the change in government long-term debt securities held abroad, which has been negative from 2010 onwards. A negative change in liabilities amounts to purchasing back the existing stock of debt(1). Another large part has been transferred to the domestic financial sector, either by purchasing equities (line 3 in Table 1, obtained from the data on flows of financial assets purchased by the government and issued by the domestic financial sector) or through capital transfers (line 4 in Table 1, which reports total capital transfers of the government). If we add the total expenditure of the government on interest payments (line 5), we get that, overall, the international loans have not been sufficient to meet these expenses. It could be argued that, had the Greek government not recapitalized Greek banks, a major banking crisis would have had even harsher consequences for the population of Greece. On the other hand, since these funds have not reached the Greek population, all debtors (households with mortgages, non-financial firms) who have experienced a severe drop in their income (for households) or sales (for firms) may be unable to meet their financial obligations, and this will imply a new, possibly large, fall in the value of the assets of the Greek financial sector, requiring more government intervention. The only way to have addressed the Greek public debt problem, which was indeed a problem of foreign debt, in a sustainable way should have been to strengthen the Greek economy in its ability to produce and sell abroad enough to cover for its imports. Greece needed an investment plan; as Joseph Stiglitz just said at the ongoing INET conference in Paris, the “EU addresses the imbalances by making deficit countries starve instead of increasing their exports” (as tweeted by INET). (1) In 2010 and 2011 a large negative value in the flow of government securities held abroad was matched, for a total of roughly 20 billion euros, by an increase in the flow held by the Greek financial sector. How Do We End the Inequality Feedback Loop? Pavlina Tcherneva has revisited her (in)famous inequality chart, which showed an ever-rising majority of the income growth during post-1970s economic expansions being captured by the wealthy (specifically the top 10 percent of income earners). 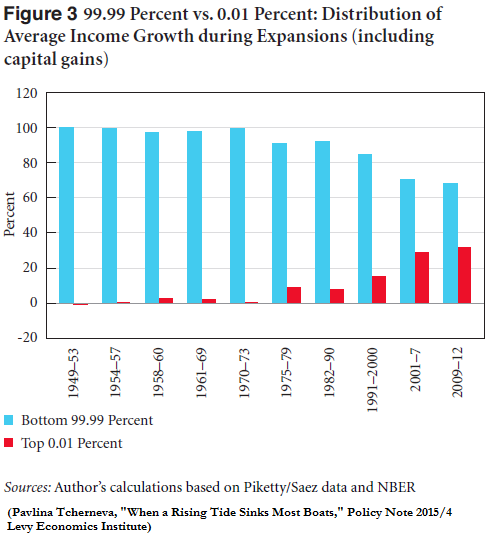 In a recently released policy note, “When a Rising Tide Sinks Most Boats: Trends in US Income Inequality,” she has updated the numbers through 2013 and broken down the top decile further (top 1 percent and 0.01 percent), compared the results of including or excluding capital gains, and looked at what happens to the distribution of income growth when we expand our scope to the entire business cycle (Tcherneva looks at NBER-dated GDP cycles as well as “income cycles” based on real income data from Piketty and Saez). The capital gains discussion yields a somewhat counterintuitive result: when you exclude capital gains, the distribution of income growth between the top 1 percent and bottom 99 percent appears more unequal. Tcherneva explains that this is because even though the bottom 99 percent have barely any capital gains income to speak of (2 percent of their income), their shrinking wage incomes meant that, from 2009-13, these meager capital gains were making the difference between declining (excl. cap gains) and merely stagnating (incl. cap gains) incomes for the bottom 99 percent. She also includes the chart below, which, though not quite as striking at first glance, becomes even more galling as you let it sink in. The chart shows the shares of income growth captured by the bottom 99.99 percent and the top 0.01 percent. By contrast with the other charts (90 percent vs. 10 percent and 99 percent vs. 1 percent), the blue bar is still bigger than the red, but keep in mind we’re talking about a tiny fraction of a fraction of the population in that red bar — around 16,000 families — and as you can see, they gobbled up practically one-third of all the income growth in the last full expansion period (2001-07), with the same worrying trend suggesting itself.